Starting out the hop is Alison from Little Bunny Quilts. She's used a 30-degree ruler to create a three-block table runner in corals, aquas and oranges. Enjoy her tutorial and then head over to her blog to enter for a chance to win a selection of Bree fat quarters. Check out this gorgeous fabric line! For my stop on the hop, I decided to make a table runner that uses my 30 degree ruler from Creative Grids (not an affiliate link!) to make flower blocks! For each pair of flower prints (aqua/aqua, orange/orange, and coral/coral) decide which will be your "accent color" (center of the petal block) and which will be your "main color" (sides of the petal block). Trim each 1/4 yard cut to 9 inches wide, or if using fat quarters, cut 9 inch strips. From each of your "accent color" strips, cut four (4) 30 degree wedges from your 9 inch wide strip. Also cut four (4) 2.5 inch squares from each "accent color". Set these squares aside for now. From each of your "main color" strips, cut eight (8) 30 degree wedges from your 9 inch wide strip. Sew a "main color" wedge to each side of your "accent color" wedges. Don't get too worried if your points aren't perfect! Make four (4) petal units in each color, for a total of twelve (12) petal units. From your background fabric, cut six (6) 4 inch squares. Cut each square in half diagonally once for a total of twelve (12) background triangles. Sew each triangle along the long edge (hypotenuse, for you mathematicians out there!) to the beveled edge of your petal units. Trim each of your petal units to 8 inches square. Use the stitch and flip technique to attach the 2.5 inch squares to the center of each petal block with a contrasting color. Sew your four petal units into one block, making three total blocks. Sew your blocks in a row. Quilt and bind as desired. Enjoy your summery table runner! 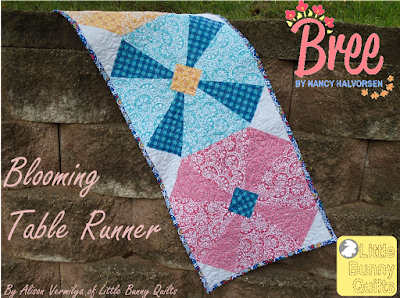 Head over to her blog for a chance to win some Bree fat quarters! What a great fabric line! Love it! Nice fabrics and I love that block. 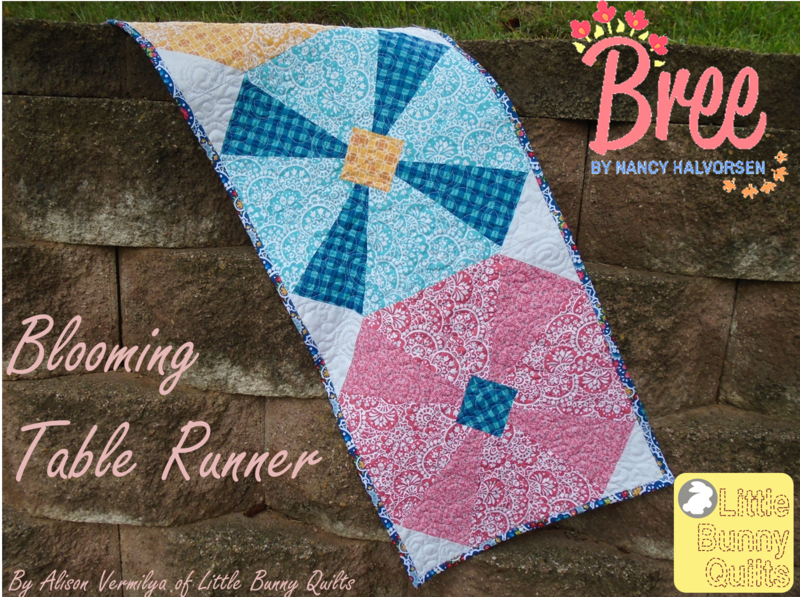 Cute runner and the fabrics are so beautiful! THANKS SO MUCH FOR SHARING! VERY NEAT! So cute....and love the Bree fabrics! Adorable fabric line and project!! Very pretty!! Love the backing too. Such a lovely table runner and great tutorial! These fabrics just worked perfectly with this project. Thank you for sharing it and for the give away opportunity. Sooo pretty! I really love these fabrics. Beautiful collection and a great runner. Thanks for the tutorial! So pretty! I really like this line of fabrics!